Today, I'm reviewing The Egg and I (1947). 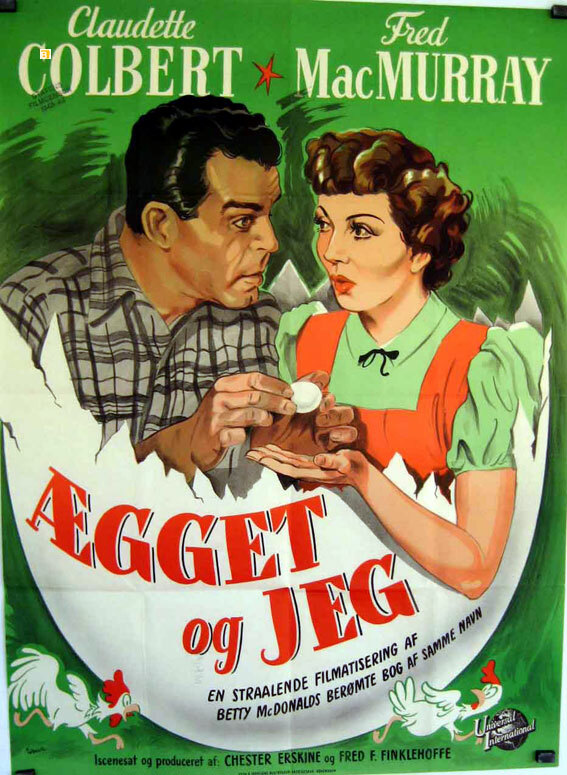 This delightful comedy stars Fred MacMurray and Claudette Colbert as a newlywed couple who take up chicken farming. This article is part of the Food in Film Blogathon hosted by Speakeasy and Silver Screenings. These days, organic farming is all the rage. However, decades before hipsters started building designer chicken coops and wearing form-fitting flannel shirts, the delightful comedy The Egg and I satirized the trials and tribulations of a young couple who leave their comfortable urban life to start a farm. 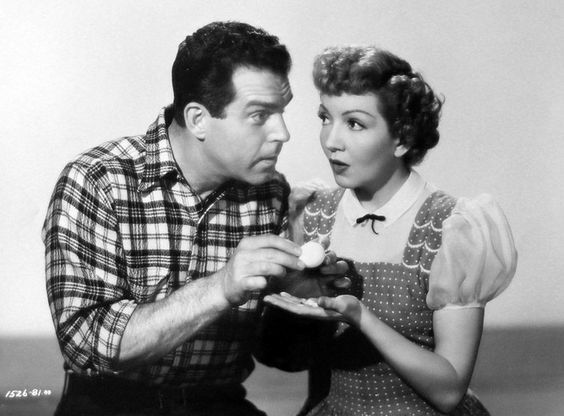 The Egg and I tells the story of Betty MacDonald (Claudette Colbert) a newlywed whose husband, Bob (Fred MacMurray), drops a bombshell on their wedding night: Bob has resigned from his comfortable sales job to pursue his dream of becoming a chicken farmer. With that goal in mind, Bob purchases a rundown 40-acre farm complete with a dilapidated barn, leaking roof, and an ancient wood stove. Soon an enthusiastic Bob and a reluctant Betty start fixing up the place despite problems with Mother Nature, uncooperative animals, and their neighbors; the workshy Pa Kettle (Percy Kilbride) likes to "borrow" equipment and supplies, while glamorous farmer Harriet Putnam (Louise Albritton) has more than a professional interest in Bob. The Egg and I is based on a memoir by author Betty MacDonald that affectionately recounts MacDonald and her first husband's struggles to establish a chicken farm in rural Washington state during the 1920s. The Egg and I was a runaway bestseller and Universal-International Pictures quickly bought the rights for an expensive production featuring popular screen team Colbert and MacMurray (this was the sixth of their seven films together). The result was a major hit that made a bundle of money for Universal and led to a successful series of spin-off movies starring Kilbride and Marjorie Main as Pa and Ma Kettle (Main earned an Academy Award nomination for best supporting actress for The Egg and I). In fact, Kilbride and Main are so memorable as Pa and Ma that The Egg and I is often considered the first of the Kettle movies -- I first watched it on AMC in the 1990s as part of a Ma and Pa Kettle marathon -- but the real focus is on the relationship between Bob and Betty, who are played with delightful warmth and expert comic timing by MacMurray and Colbert. MacMurray had plenty of dramatic chops as anyone who's seen Double Indemnity (1944) knows, but the actor also possessed a razor-sharp comic timing that serves him well as the dedicated but naive Bob, who is something of farming geek. Bob likes to wear flannel shirts, study crop timetables, and discuss the breeding patterns of the speckled Sussex chicken; in my mind, Bob is a forties forerunner of the new type of organic farmers that can often be found at suburban farmer's markets selling their bok choy or naturally aged goat cheese. Bob doesn't have a beard, which seems to be de rigueur in the 21st century (I live near Amish country, and sometimes it can be difficult to differentiate between the Amish and those who just look like they're Amish), but he does share with his modern counterparts the desire to leave the modern world behind for a simpler lifestyle. Bob, whose farming dreams started during his service in World War II (this information is relayed comically in the film, but today we would say Bob suffered from post-traumatic stress), wants to get away from society and lead a more authentic life where he can breath fresh air, work with his hands, and have the satisfaction of eating homegrown food. 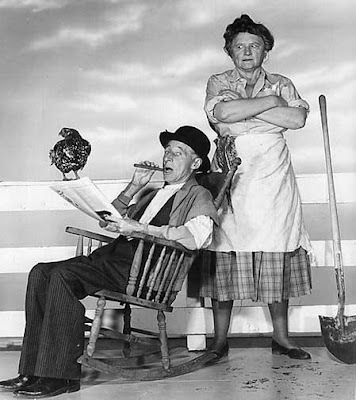 Percy Kilbride and Marjorie Main as Pa and Ma Kettle. My philosophizing above might make The Egg and I sound too serious, but, don't worry, it's a delightfully funny comedy with great comic performances from Billy House as a pushy salesman ("when you're in need, call Billy Reed"), Ida Moore as a dotty old lady who converses with her long-lost husband, and Donald MacBride, who has one of best slow burns in the business, as an uptight egg distributor. Even if you aren't interested in farming, The Egg and I will give you a new appreciation for the farmers who work so hard to supply our daily bread, not to mention our daily eggs. The Egg and I is available on DVD and video on demand. What a grand choice for the blogathon. I can hear Claudette admonishing the audience about not thinking at all about the ubiquitous breakfast egg as she begins her tale. What a boon for Universal with the Kettles! I always think of that scene when I see anyone wasting food. This film is based on one of my grandmother's favourite books. She had a very old copy on her bookshelf and it wasn't until years later that I discovered a movie had been made. And what a fab movie it is! I love Fred MacMurray and Claudette Colbert together – like you say, they have perfect timing. When I saw this at TCMFF (and maybe you were there too?) Fred MacMurray's daughter said Claudette C was one of his favourite leading actresses. Claudette Colbert was my grandmother's favorite actress and The Egg and I was one of her movies. I love that this one was covered, can't forget the egg! 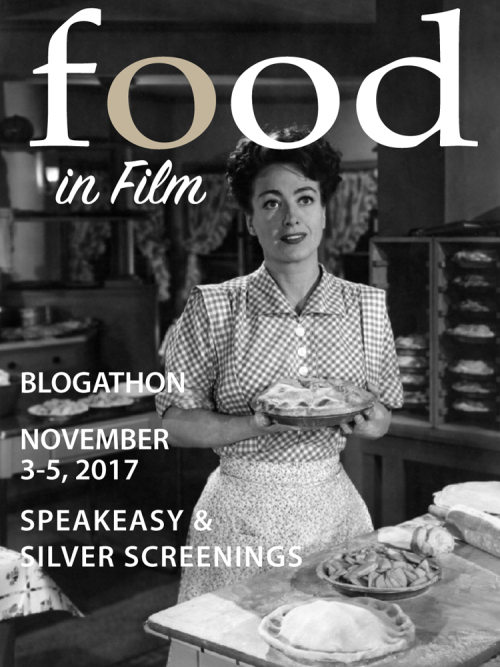 Thanks for being part of the blogathon!